The Story of Charles I. Daniels, Jr. (Chuck), February 13, 1926 - December 28, 2010, Fire Investigator and San Rafael Fire Commission Board Member. 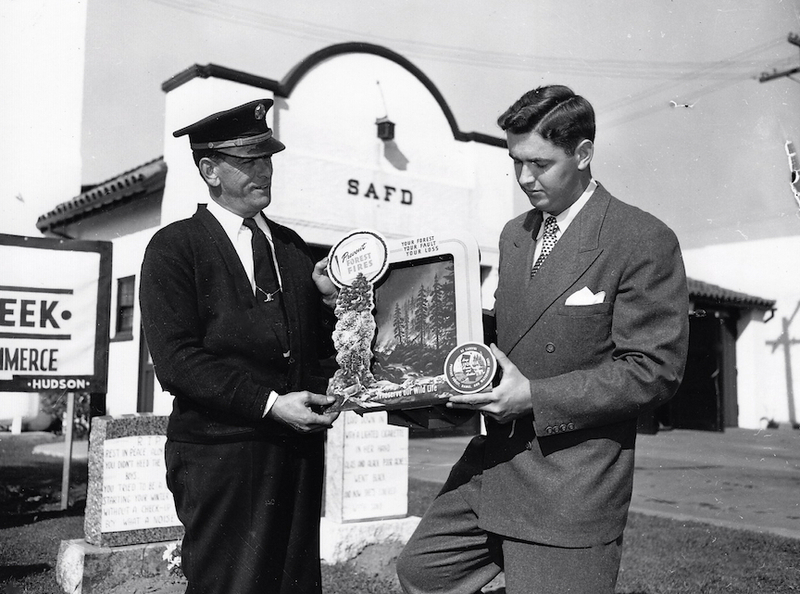 (l-r) San Anselmo FD Fire Chief Nello Marcucci accepts a Fire Prevention Week Sign from a young Chuck Daniels in front of the San Anselmo FD on October 6, 1949. Chuck Daniels was born in San Francisco, but spent most his life in Marin County. He made significant contributions to the fire service in Marin, in addition to many other community activities. ​Loving husband of his lifelong partner Carol Lund Daniels, loving father of Charles I. Daniels the third (Chal), Peter Lund Daniels and Jonathan Daniels, Father In-law of Nani, Larissa and Marie Daniels. Loving Grandfather of Christina, Chase, Taylor, Tove and Cael Daniels, Anya and Peter Jake Daniels and Kathryn Ann Daniels, brother of Marilyn Daniels Raymond and Godparent of Lisa Slattery and Lisa Ward. Chuck's business career was for the most part in the beverage industry for over a period of 75 years, always based in Marin County. He served as President and CEO of the House of Daniels Inc., a sales and marketing firm handling wines, distilled spirits, beer and new age beverages doing business as Golden Gate Distributing Company, Redwood Vintners, Blackpoint Marketing and Trellis Vineyards. In 2005 the House of Daniels sold its last interest in the beverage business, at which time the warehouse and office facilities in Black Point, Novato were transformed into a boat/RV and self storage operation currently operating as Heirloom Storage. Chuck continued as Chief Executive Officer, of Heirloom Storage and Daniels Real Estate/Investments. Chuck was a California director of the Wine and Spirits Wholesalers Association of America, past President of the California Beer Distributors Association, a past Vice President of the Northern California Wine and Spirits Wholesaler Association, a past Vice President Treasurer and on the Executive Committee of the Robert Mondavi Winery. He was an owner of his own winery, Trellis Vineyards, proud to produce 100% Sonoma County wines. He was a Supreme Knight of the California Knights of the Vine, a member of the Family Winemakers of California, a member of the North Coast Growers Association, a member of the Sonoma County Wineries Association, a member of the Old Timers Wine Club of Northern California. He was a founding member of the Generations Club of Marin, with his close friends Mario Ghilotti, Bill Murray and Ted Murray. He helped form the Tocaloma Temperance Society and the Marin Republican Council. He was past member and officer of the Marin Republican Central Committee. He attended the University of Santa Clara, Saint Anselms High School and was student body President of College of Marin. A Veteran of the Army Air Corps, during World War Two. Always most active in community service and public safety issues. He was a member of the California Crime Commission, during Governor Reagan's term in office. He was active in the investigative field of the crime of arson for the District Attorney's office, Police, Sheriff's Office and Fire Departments of Marin County. Recently he served as Chairman of the Fire Commission of the San Rafael Fire Department. In youth work he served on the Executive Committee and was Vice President of Youth Activities-CYO of the Archdiocese of San Francisco, he served on the Executive Committee and as a past Officer of the Marin Council of Boy Scouts. He was named "Marin County's Distinguished Citizen of the Year" by the Marin Council of Boy Scouts in 1997. He was active in many phases of work for Saint Vincent's School for Boys and an active member of the Dominican University's Leadership Forum (Presidents Council) Executive Committee. While in his position with the Dominican University, he worked passionately for the renovation of the Edgehill Mansion and Chapel. Believing that places of such historical value and worship must be preserved for generations to come. He was a Fourth Degree Knight of Columbus, a member of Saint Raphael's Church, a member of the Rotary Club of San Rafael, a member of Elks Lodge 1108. A past member of the Marin County Peace Officers Association. A member of the Wilkins Post, of the American Legion. A member of the Meadow Club of Fairfax for over fifty years. A past member of the Board of Directors of West America Bank. He loved swimming as a sport and was founding member of the Elks Lodge Dippers Club. He enjoyed seasonal sports and vacations at Lake Tahoe. As a youth he spent summer vacations at the Tahoe Tavern, then at Homewood Resort and finally spent his last 52 years consecutively at the Meeks Bay Resort. His love for the beach and friends he made there, were life lasting. He was seasonal Director of the North Lake Tahoe Historical Society. He also loved the high country of Yosemite and was a long time supporter of the Yosemite Vintners Holiday Program. His enjoyment both business wise and socially, was to know and visit with his wife Carol, the finest restaurateurs and Chefs of California, as well as other restaurateurs located in fine wine growing regions around the world. He loved sharing the wines of the world with his family and friends. "I met Mr. Charles Daniels, Jr. in 1992 when I joined the San Rafael Fire Commission. From 1992 until Mr. Daniels’ death in 2010, I considered it a privilege, an honor and an education to know and work with Chuck. The first thing you noticed about Mr. Daniels (because you are 'known by your look') was that he was always dressed professionally. At the Fire Commission meetings, Department functions, Holiday parties, and even informal meetings in the Fire Chief’s office, Chuck was always impeccably dressed in a sport coat and tie. Recognizing that he represented San Rafael City and Fire Department, Chuck was welcoming, cordial, curious, good natured and proud to be recognized as a San Rafael Fire Commissioner. Chuck told colorful stories about his life experiences, both personally (Yosemite, Lake Tahoe, his vineyard, his family) and professionally in the realm of arson investigation where he had considerable experience. Chuck was continually impressed by the expertise, commitment, creativity and diligence of the Fire Chiefs & Department members with whom he worked. He would consistently comment, 'We should call the Marin Independent Journal & have them educate the public about the exceptional work of the San Rafael Fire Department.' Chuck was passionate, concerned and knowledgeable about the City of San Rafael. He would have been enthusiastic to participate in the Marin County Fire History Project because he supported public recognition of the activities and accomplishments of San Rafael firefighters."